They turned to Land For Good for support and guidance to acquire the farm. 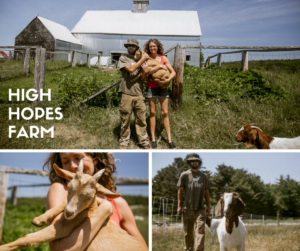 Working with Jo, LFG’s Maine field agent, they were able to successfully navigate the land acquisition process that enabled them to launch their new endeavor, High Hopes Farm. 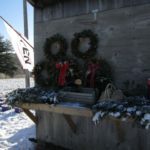 The couple closed on the property this summer and began moving animals, vegetables, and some of the small buildings from their 3.4-acre property down the road to their new, 120-acre farm. Luckily the old Sigler farm did not go fallow. The land is now supporting a new farm business and a new generation of farmers. “Everyone’s been really thrilled and excited to know that this is still a farm and will stay one. Fifty years from now, when they’re driving over the hill, it will still look like this,” said Meaghan. But a new generation of farmers eagerly seeking land and farming opportunity does not mean that established farmers are certain of their desired legacy of passing on a working farm. 90% of retirement-age farmers in New England do not have a young operator farming alongside them, and likely do not have successors identified to continue stewarding their farms. (Gaining Insights, Gaining Access) How and to whom these farms transfer will have an enormous impact on the future of farming in our region. That’s why our work with and for exiting farmers is so important to help them secure their farm’s legacy during their lifetime and transition more farms to a generation of new eager farmers. “It took a whole team of people who had knowledge that we lacked,” Meaghan said. Land For Good partners with leading state organizations to do more than just help farmers and landowners find each other and other services. 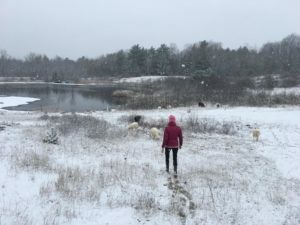 Jo, LFG’s Maine Field Agent, is intimately involved with the Maine Organic Farmers and Gardeners Association’s Journeypersons program (the oldest program of its type in the country), providing land access readiness training and support. 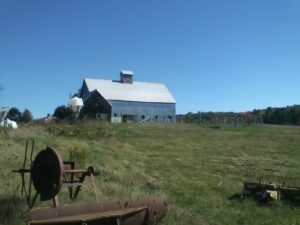 And when Maine Farmland Trust seeks to conserve and transfer farmland to new owners as part of its Maine FarmLink program, Jo is frequently brought in to help with the development of tenure agreements. Congratulations to Ross and Meaghan Nichols who are enjoying a busy holiday season! A farm that had gone fallow for years is working again with a new generation of farmer-owners.